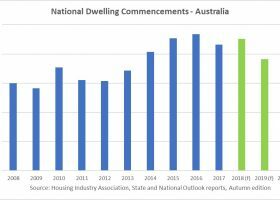 Approvals for the construction of new homes continue to soar, indicating house building could be a shining light for the economy. But growing home construction is unlikely to end the current surge in property prices, economists said. Local councils approved the construction of 16,810 new homes in August, a rise of 3.0 per cent from July, figures from the Australian Bureau of Statistics show. That smashed economists’ expectations of a 0.5 per cent rise. Approvals for the year to August were up 14.5 per cent. The figures show there is plenty of work to come for Australia’s building industry, JP Morgan economist Tom Kennedy said. “That’s a good sign and it suggests that there is still a bit of work in the pipeline to go, at least in the residential space, which should be supportive for growth as we head into the back half of the year,” he said. The monthly rise came from approvals for multi-unit dwellings, while approvals for detached houses were down 1.8 per cent. Construction of detached houses creates more stimulus for the economy. “It is a little lopsided in the sense that it is high residential buildings that are doing the heavy lifting here, but in saying that, detached housing is still tracking at good levels and levels that are still pretty close to record highs,” Mr Kennedy said. National Australia Bank senior economist Spiros Papadopoulos said the increase in housing supply was unlikely to ease rising home prices. “We had a big surge in building approvals towards the end of last year on the private houses side, and we’ve got ongoing growth in the apartments side during the course of this year,” he said. Mr Papadopoulos expects to see home prices growth to continue into 2015. “And indeed until the Reserve Bank is in a position to raise interest rates again,” he said. Housing construction is on track to become a shining light of the Australian economy, with a record number of building approvals expected to translate to more construction jobs and ringing at the tills. Local councils approved the construction of 16,810 new homes in August, a rise of three per cent from July, seasonally adjusted figures from the Australian Bureau of Statistics show. Approvals for the year to August surged almost 15 per cent to a record 198,000, thanks to low interest rates and investor appetite for new buildings. Economists expect the strong lift in approvals will eventually flow through to construction, and then into retail, as people seek to furnish their new homes. The lift in supply will also help cool house price growth, CommSec economist Savanth Sebastian said. “Fundamentally, the growth in house prices has been driven by a lack of stock, and a substantial lift in new housing stock should ensure more sedate price growth over the longer term,” he said. Thursday’s figures, along with lead indicators suggesting further demand for new construction, meant the current construction boom would run well into 2015, Commonwealth Bank economist Diana Mousina said. Rising house prices had also encouraged people to renovate their homes, Ms Mousina said, with alterations and additions activity up 11 per cent over the year. She said the positive effects from building approvals were already being seen in Victoria and NSW, where approvals rose 15.5 per cent and 2.9 per cent in August, respectively. “The strength in residential construction in NSW and Victoria is having visible positive impacts on these economies,” Ms Mousina said. The sharp rise in approvals in Victoria, however, poses an oversupply risk because of the recent high levels of apartment construction in Melbourne – a risk the Reserve Bank noted in its recent Financial Stability Review. Westpac senior economist Matthew Hassan said the strength in building approvals was linked to investor activity in Sydney and Melbourne. “How this segment unfolds in coming months will likely have a strong bearing on the direction of dwelling approvals and the degree to which the current surge in dwelling construction extends into 2015,” he said. RBA assistant governor Malcolm Edey on Thursday told a Senate committee that new regulations would be introduced to cool Australia’s housing market, as a surge in loans to investors had created an imbalance. He also said an increase in housing construction was likely the best way to rein in surging house prices.